Descant to the hymn tune CHRISTE SANCTORUM. 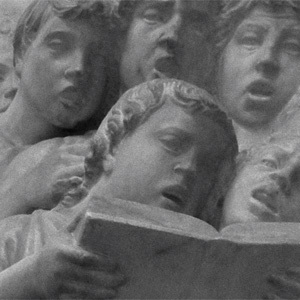 Free score with harmonized descant and optional SATB a cappella verse. CHRISTE SANCTORUM is in the class of the 'French diocesan tunes' that emerged from Rouen in the 17th and 18th centuries. Most were written as melody only in square note neumes, though organ accompaniment books for these tunes were also in circulation. As it happens, caring not a whit for any previous harmonization, Ralph Vaughan Williams rescued this tune from the scrap heap of history and infused the tune with his own majestic harmonization for the 1906 English Hymnal. The text 'Christ, the fair glory of the holy angels,' is a translation of a 9th C. office hymn for the Feast of St Michael and All Angels, Christe sanctorum decus angelorum. This hymn names the celestial visitors who have graced this earth, and once again calls on them to renew their graces: Christ the Savior, three archangels (Michael, defender; Gabriel, herald; Raphael, healer), Mary, the saints, and all the company of angels. The hymn concludes with a doxology. This tune is now frequently paired with the Matins (midnight) hymn "Father we praise thee," now a morning hymn given prime placement in Hymnal 1982 as hymn no. 1. Fred Pratt Green's text "Christ is the world's light" is another very popular pairing; while the English version of the Latin hymn Christe sanctorum is usually sung to another French tune from the same period, CAELITES PLAUDANT.